RTH (Rettungstransporthubschrauber) EC135 P2 D-HHIT "Christoph Europa 1" was photographed at the helipad of the ADAC-Luftrettungszentrum Würselen. This Air Rescue Station is situated at Verkehrslandeplatz Aachen-Merzbrück in Germany and since 18 September 2010, the air rescue center is located in a completely new developed building, including the most modern requirements. Operations of this RTH started on 14 August 1974 as "SAR 72" flown by Bundeswehr with a Dornier Bell UH-1D at Rettungzentrum Würselen, in the beginning also known as Rettungszentrum Aachen. Until 1 March 1998, the military Dornier Bell UH-1D SAR / Notartz helicopter was the standard machine of RTH "SAR 72". On 1 March 1998, the Bundeswehr was replaced in service as helicopter operator of the Luftrettungszentrum Würselen by ADAC Luftrettung. Call sign "SAR 72" changed in that time to "Christoph Europe 1". Because the catchment aerea of the RTH is also across national borders the name "Christoph Europe 1" was choosen instead of "Christoph 21". The callsign "Christoph" is used for the German lifeliner helicopters since 1970 and is derived of Saint Christophorus, the Patron Saint for all travellers. 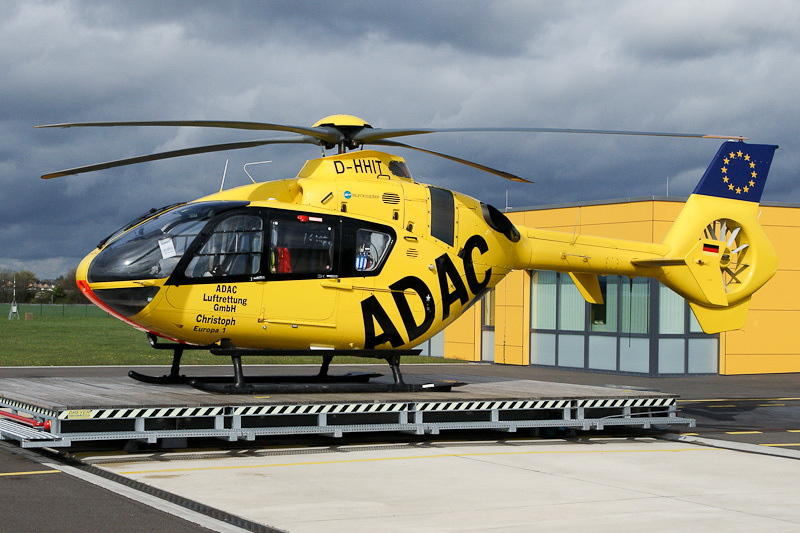 The 2005-built Eurocopter EC-135 P2 D-HHIT was registered on 18 January 2005 and delivered to the ADAC Luftrettung GmbH in Germany. Eurocopter EC135 P2 D-HHIT is used to operate as "Christoph Europe 1", but was in the past also operated as back-up for the MMT Lifeliners in the Netherlands.